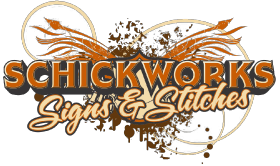 If you are interested in learning more about our signs, custom apparel or promotional items, or if you would like to place an order, please contact us. You can complete the convenient form provided on this page, detailing your specific request or inquiry, and we will respond as quickly as possible. You may also reach us by telephone or email. We would be happy to make your designs and ideas take shape, creating truly custom advertising and promotional products for your business.